Anton Paar releases its pressurised Multiwave 7000 microwave digestion system for performing laboratory based acid digestion analysis. The Multiwave 7000 microwave digestion system from Anton Paar combines the concept of the company’s HPA-S with modern microwave technology, representing the best way of performing acid digestion. Multiwave 7000 stands for complete digestions, a streamlined workflow, lightweight accessories, easy-to-handle vials, budget-friendly upgrades, ready-to-use methods and automated cleaning procedures. The core feature of Multiwave 7000 is the PDC (Pressurised Digestion Cavity). In contrast to conventionally used microwave digestion systems, the cavity is used as a pressure jacket instead of using pressure vessels. This enables the use of thin-walled, budget-friendly vials made of quartz, PTFE-TFM, or disposable vials made of glass. The vials are closed with plug-on caps for tool-free, even screw-free, handling. Up to 24 vials are placed in a lightweight PTFE rack. The filled rack is placed in a liner filled with a load solution. The maximum weight which needs to be carried to the instrument including vials, rack, liner and load solution is less than 1 kg. Prior to microwave heating the cavity is pressurised with nitrogen. This pressure-sealing suppresses foaming and boiling during the digestion and thus eliminates cross-contamination or loss of volatile elements. The load solution ensures homogenous heating of all samples and acts as an absorber for exothermic reactions. Complete digestions of virtually any sample type are achieved with temperatures of up to 300 °C. Up to 24 food, soil, polymer, ceramic, pharmaceutical, petroleum, metal, geological, and cosmetic samples can be digested simultaneously. For floating samples or samples that form a heavy layer, stirring can be performed during the digestion. This gives you the certainty that you will be able to digest your samples and the samples you need to prepare in future. Sample clustering results in digestions at half capacity and the related wasted time. With Multiwave 7000 different samples can be processed in the same run, even using different reaction mixtures and different vial materials. For example: polymers can be digested with HF in PTFE vials and without HF in quartz vials in the same experiment. For reaction control, the temperature and pressure sensors are integrated in the PDC and measure the temperature and pressure of all samples. Only a few methods are necessary to digest this wide variety of samples and these are already implemented in Multiwave 7000. In the manual you will find a list of samples and the corresponding method. Together with Anton Paar’s customer-specific application support, time-consuming method development is a thing of the past. With conventional systems often a compromise between sample throughput and digestion temperature has to be made. High temperature often results in low sample throughput. 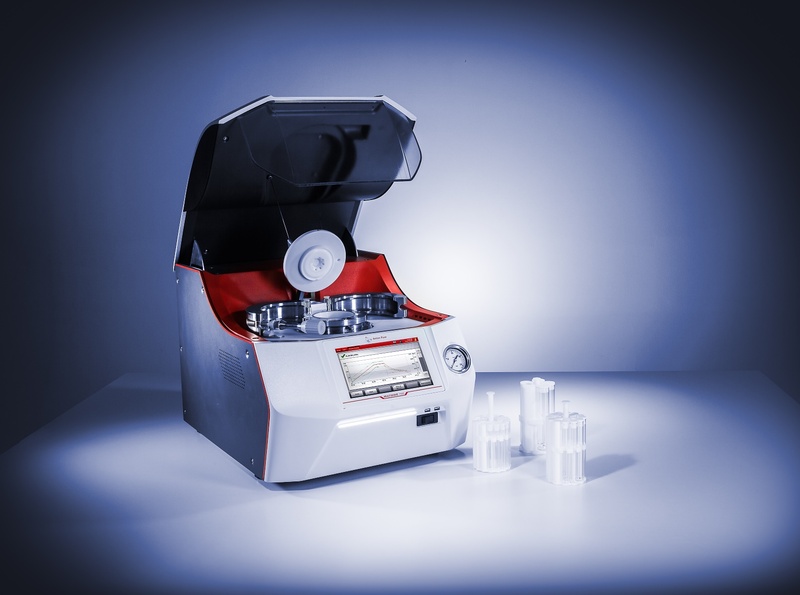 The PDC of Multiwave 7000 enables the simultaneous digestion of up to 24 samples at temperatures of up to 300 °C. A high power of 2000 W and an integrated water cooling minimize the heating and cooling times and thus maximize your sample throughput. Depending on the sample and the concentration of the analyte, vessel cleaning can be a cumbersome task. Cleaning runs in-between digestion runs lower the sample throughput and also result in higher acid consumptions. No cleaning runs are needed when using disposable vials. When using quartz vials flushing the vials with distilled water or diluted acids in-between the digestion runs is often sufficient. Instrument cleaning is supported by automated cleaning procedures which further reduce workload. The budget-friendly thin-walled vials together with budget-friendly vial racks remarkably reduce your running costs. The vials do not have any minimum filling volumes so 0.3 g to 0.5 g of sample can be digested with only 2 mL to 4 mL of acid, resulting in lower acid consumptions and reducing costs. Walking back and forth between your desk and the digestion system to see whether the process is completed wastes time. To avoid this, Multiwave 7000 automatically sends notifications of completed runs via email and notifies you via audio signal. Additionally, you can follow the digestion process from your computer or mobile phone via remote control. If you can see the device from your workspace, you can keep informed about the instrument status via the Smart Light. The color and the mode of the Smart Light changes according to whether the experiment is in progress, finished, or the instrument is in standby.